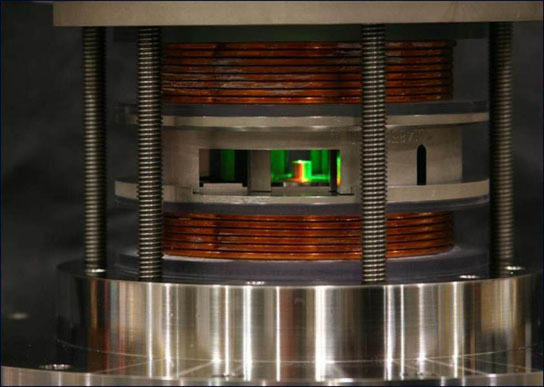 In a method that appears to be 50 times more efficient than using X-rays, computer simulations showed that high-gain nuclear fusion is possible in a preheated cylindrical container immersed in strong magnetic fields. ALBUQUERQUE, New Mexico — High-gain nuclear fusion could be achieved in a preheated cylindrical container immersed in strong magnetic fields, according to a series of computer simulations performed at Sandia National Laboratories. The simulations show the release of output energy that was, remarkably, many times greater than the energy fed into the container’s liner. The method appears to be 50 times more efficient than using X-rays — a previous favorite at Sandia — to drive implosions of targeted materials to create fusion conditions. High-gain fusion means getting substantially more energy out of a material than is put into it. Inertial refers to the compression in situ over nanoseconds of a small amount of targeted fuel. Such fusion eventually could produce reliable electricity from seawater, the most plentiful material on earth, rather than from the raw materials used by other methods: uranium, coal, oil, gas, sun or wind. In the simulations, the output demonstrated was 100 times that of a 60 million amperes (MA) input current. The output rose steeply as the current increased: 1,000 times input was achieved from an incoming pulse of 70 MA. Since Sandia’s Z machine can bring a maximum of only 26 MA to bear upon a target, the researchers would be happy with a proof-of-principle result called scientific break-even, in which the amount of energy leaving the target equals the amount of energy put into the deuterium-tritium fuel. This has never been achieved in the laboratory and would be a valuable addition to fusion science, said Slutz. Inertial fusion would provide better data for increasingly accurate simulations of nuclear explosions, which is valuable because the U.S. last tested a weapon in its aging nuclear stockpile in 1992. The MIF technique heats the fusion fuel (deuterium-tritium) by compression as in normal inertial fusion, but uses a magnetic field to suppress heat loss during implosion. The magnetic field acts like a kind of shower curtain to prevent charged particles like electrons and alpha particles from leaving the party early and draining energy from the reaction. The simulated process relies upon a single, relatively low-powered laser to preheat a deuterium-tritium gas mixture that sits within a small liner. At the top and bottom of the liner are two slightly larger coils that, when electrically powered, create a joined vertical magnetic field that penetrates into the liner, reducing energy loss from charged particles attempting to escape through the liner’s walls. An extremely strong magnetic field is created on the surface of the liner by a separate, very powerful electrical current, generated by a pulsed power accelerator such as Z. The force of this huge magnetic field pushes the liner inward to a fraction of its original diameter. It also compresses the magnetic field emanating from the coils. The combination is powerful enough to force atoms of gaseous fuel into intimate contact with each other, fusing them. Heat released from that reaction raised the gaseous fuel’s temperature high enough to ignite a layer of frozen and therefore denser deuterium-tritium fuel coating the inside of the liner. The heat transfer is similar to the way kindling heats a log: when the log ignites, the real heat — here high-yield fusion from ignited frozen fuel — commences. Tests of physical equipment necessary to validate the computer simulations are already under way at Z, and a laboratory result is expected by late 2013, said Sandia engineer Dean Rovang. Portions of the design are slated to receive their first tests in March and continue into early winter. Sandia has performed preliminary tests of the coils. Potential problems involve controlling instabilities in the liner and in the magnetic field that might prevent the fuel from constricting evenly, an essential condition for a useful implosion. Even isolating the factors contributing to this hundred-nanosecond-long compression event, in order to adjust them, will be challenging. The work, reported in the Jan. 13 issue of Physical Review Letters, was supported by Sandia’s Laboratory Directed Research and Development office and by the National Nuclear Security Administration. Be the first to comment on "Computer Simulation Shows High-Gain Nuclear Fusion"